The Witches Brew is a full service brew shop for all your home wine, beer, and soda making needs. We have a full range of supplies that you can use to make your own beer, wine, and specialty drinks. We also stock pre-packaged beer and wine kits, specialty grains, yeasts, and other key ingredients. As our slogan states, "If we don't have it, you don't need it!" 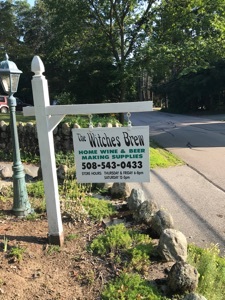 The Witches Brew is currently located on Maple Ave in Foxboro, MA. It was originally owned and operated by Bob Stocks on Bakers Street in Foxboro, MA. The company, a small home-based operation, moved to Steve Andberg's basement in the year 2000. If you have never brewed before come by during our regular store hours and our knowledgeable staff (and regular customers) will be glad to help you in any way they can. You can even try some free samples of the wines and beers and if you like them, we can teach you how to make them at home. If you are an experienced brewer or wine maker come by and bring a sample of your own for our store "beer and wine experts" to try! Our customer service and friendly atmosphere make The Witches Brew a great place to meet other brewers, gain knowledge about different styles, and learn new twists on your favorite recipes, or just have fun. Come by and see us, you will be glad you did! Sorry we do not currently accept online orders.